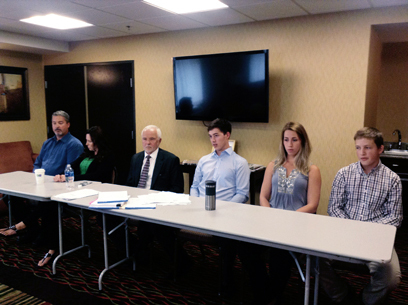 Garrett Neese/Daily Mining Gazette File photo Matthew Schultz, center, talks during a press conference announcing his lawsuit against Michigan Technological University in September. GRAND RAPIDS — A federal court hearing on a motion to dismiss a former Michigan Technological University student’s suit against the university after it expelled him over a post made on social media has been pushed back three weeks. The hearing in the case of Matthew Schultz, originally scheduled for Feb. 2 in Grand Rapids, will now take place Feb. 21. Schultz sued Michigan Tech and numerous officials, as well as Ryan Grainger, a former Tech student whose Twitter account posted a doctored version of Schultz’s post. Schultz made the post on the social media app Yik Yak, which lets users see posts made within a 5-mile radius. Schultz was first suspended for 18 months and then expelled from Tech after posting “I’m gonna shoot all black people …… a smile tomorrow” followed by a smiley-face emoji. Schultz is seeking damages of more than $75,000 and reinstatement to the university. He alleges that the university violated his First Amendment right to free speech, while the university’s disciplinary process violated due process. The university is seeking dismissal on several grounds, including that the original post could be considered a “true threat,” stripping it of First Amendment protection, and that Tech employees named individually in the suit should receive qualified immunity for performing their jobs. In his response, Grainger said he had not altered the screenshot of Schultz’s post but had received it from another operator of the @MTUYaks Twitter account after Schultz’s original post went out.